Tulips blowing gently in the breeze are a sign that summer is around the corner. 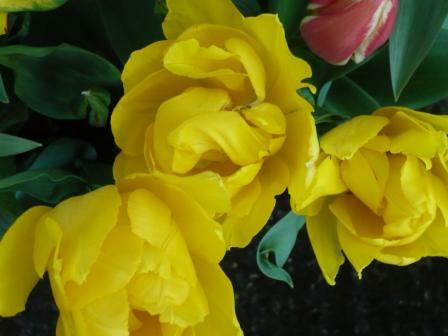 If you only grow a few tulips then why not splash out on bulbs that will produce double flowers. Tulips can be planted until the end of November. 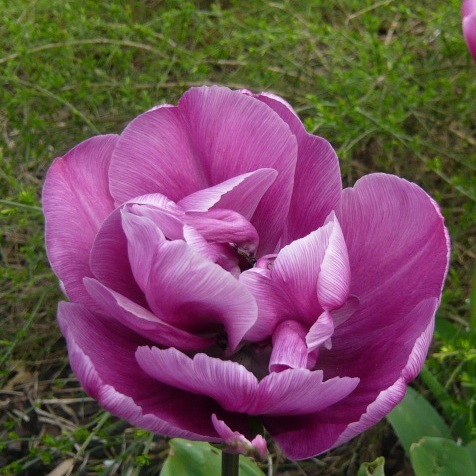 Double flowers have more than one array of petals so the flower is fuller of petal and colour. That is not just twice the number of petals but more than one array or ring. Usually the structure of regular flower would be compose of 4 rings; Sepals, Petals, Stamens and Pistils. Sepals are the outermost, green leaf-like organs to support flower when were young. Petals are the main organ to show a flowers appearance. Stamens and Pistils are male and female pollen. Truly Double Flowers must have all 4 rings in each flower but common parlance has more than one ring of petals as a double. Roses, Carnations, Camellia and Peonies often seen in double flowered mode. The latin sobriquet ‘flore pleno’, means full flowered and if you buy a plant with this in its name it should be a double. It is still November and you can plant tulips for flowering in late spring. Double tulips like this treatment. Holland Baby is a Kaufmanniana type of water lily tulips in vivid red like the variety above. It is early flowering and naturalises in a good sunny position. Double Red Riding Hood tells all in the name. Like other greigii tulips the leaves are spotted or mottled. 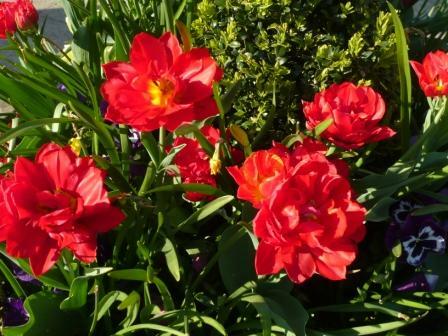 Monte double tulips are available with orange and red flowers. A good bulb merchant will have a wider selection of double flowered varieties. Narcissus Golden Ducat is yellow with double flowers. Height 35cm. Flowers late March. Rudbekia ‘goldquelle’, Chrysanthemums and many Dahlias are double. As you can see I like the red and yellow double Tulips currently flowering in my garden. Any gardener seeking a long floral display should opt for doubles as they tend to last for longer. they are just beautiful, and si different from the common ones too!